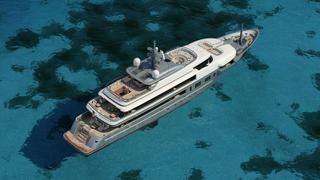 Italian yard VSY has released new renderings of its in-build 64 metre superyacht Project 003. The yacht is due for delivery in spring 2019 and is currently in the final stages of construction at VSY's shipyard in Viareggio. Espen Øino is responsible for the exterior while interiors are from French studio Darnet Design. The general arrangement will feature six suites, including an owner’s cabin with panoramic views out to sea and exterior terraces, while an aft-facing skylounge will also boast uninterrupted vistas thanks to its minimal structural design. 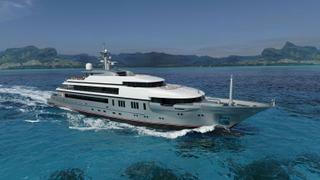 Accommodation is for 12 guests, while the crew quarters have been designed for a staff of up to 16. Darnet Design founder Franck Darnet describes the interior décor as “warm contemporary”, using textured leather panels and honed marble to create a cosy atmosphere. The woodwork will feature walnut and high-gloss elm, while metal inserts will be made from stainless steel and brushed nickel. Other key features on board this VSY superyacht will include a bridge deck gymnasium and a 12-person dive centre on the lower deck. 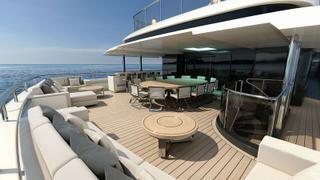 Meanwhile, the superyacht sundeck will feature an infinity pool, fire pit and separate bar area. Project 003 will have a bulbous bow for better seakeeping in rough conditions, with naval architecture created by British studio Laurent Giles. Power will come from a pair of 2,682hp Caterpillar 3516B engines for an estimated top speed of 17 knots, while the total fuel capacity of 163,000 litres should allow for a globetrotting maximum range of 5,200 nautical miles at 12 knots. Despite the name, Project 003 is actually the fourth superyacht from VSY, with the Italian yard also responsible for launching Sealyon, RoMa and Stella Maris.